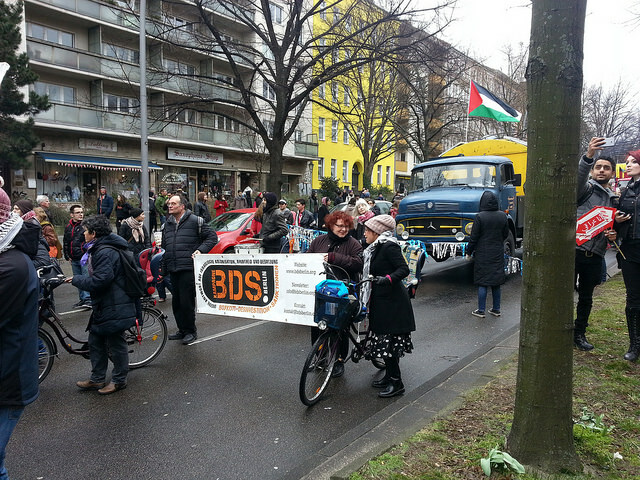 BDS Berlin auf der Demo ‘My right is your right’ Carnival Al-Lajíin_Al-Lajiáat am 20. 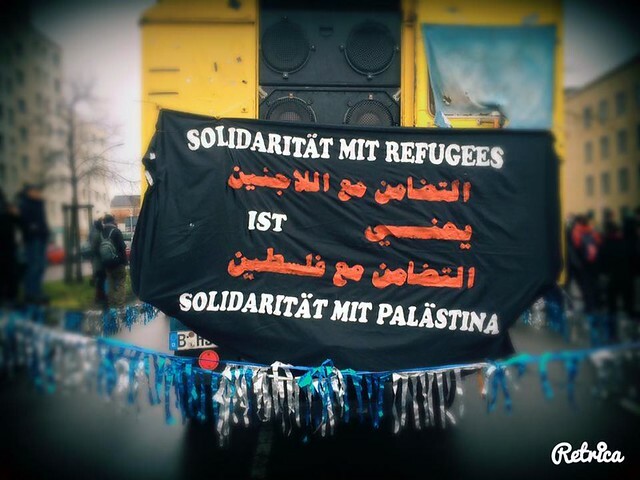 März 2016 in Berlin. 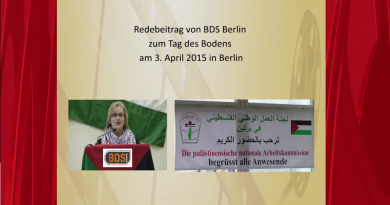 “I am happy and proud to have the opportunity to stand here and speak on behalf of BDS Berlin. As you may guess, I’m neither a Palestinian refugee nor a refugee at all. 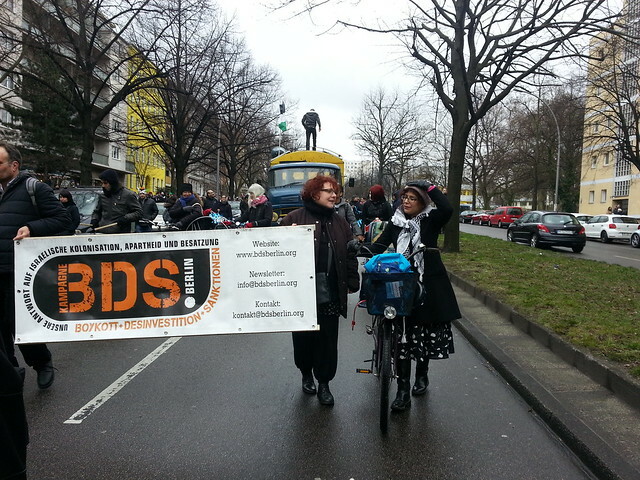 Still I address you as an activist of the BDS campaign – Boycott, Divestment & Sanctions against Israeli apartheid & for Palestinan rights – among others the right of return of the Palestinian refugees. 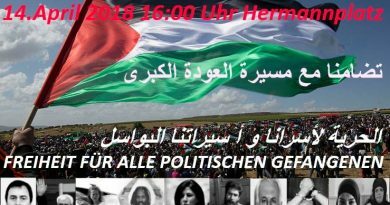 So why do I speak here and for BDS Berlin, although I enjoy all the rights Palestinians have been deprived of, namely Palestinian refugees, their children and grandchildren? I am definitely proud of being part of the Palestinian led global BDS movement – I guess one of the most successful, smartest and most inspiring movements there is, challenging – everywhere – those who don’t respect basic human rights and dignity. Also: The anti-colonial struggle in India, the civil rights movement in the US, the anti-apartheid movement in South Africa, to name just a few were like BDS grassroots, anti-racist, non-violent movements of joint struggle for basic rights and dignity. And finally: It is a question also of my I cannot enjoy rights as long as they are just privileges linked to a passport I happen to be born with. Actually this is a racist outrage. Palestinians are not just poor victims. Refugees are not just poor victims. As you don’t give up the struggle for equal rights – in the countries you had to leave or here in Germany – you definitely are not poor victims. You are role models for all of us. 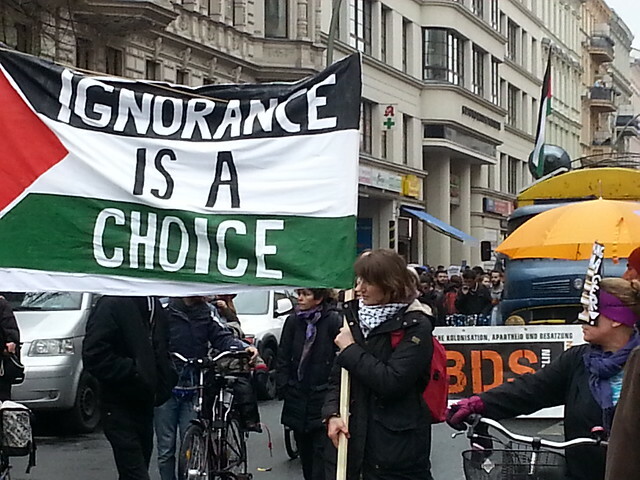 All over the world those who are involved in struggles for equality proclaim: We are Palestinians! Why? – It’s obvious: Palestinians who for so many years have refused to give in and give up their rights, don’t just defend specific or tribal interests. They stand up for justice everywhere. 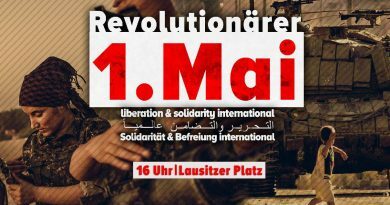 So if you had to leave your countries where life in dignity was impossible – don’t give up here in Germany or Europe – your struggle is our struggle. You lead us and show us not to give up in the face of power and violence. Let me give you just one example of how BDS works and how the campaign targets agents of oppression. – and of course in making European borders ever less permeable – another racist project. 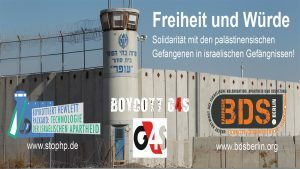 The world wide BDS campaign against G4S has succeeded recently: G4S had to pull out from their Israeli business. But of course we, BDS, remain determined to work closely with partners to hold G4S to account for its participation in human rights abuses – wherever they occur. 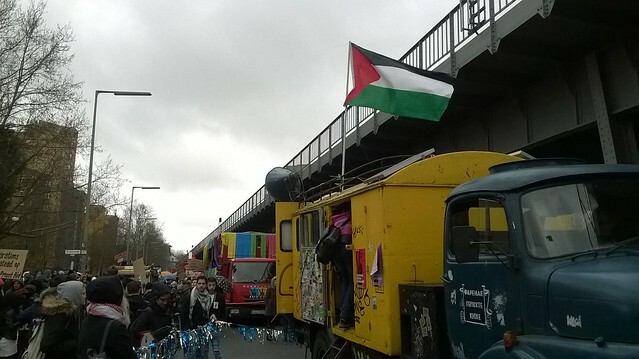 ← ISRAEL: Urlaub im Schatten der Apartheid-Mauer?